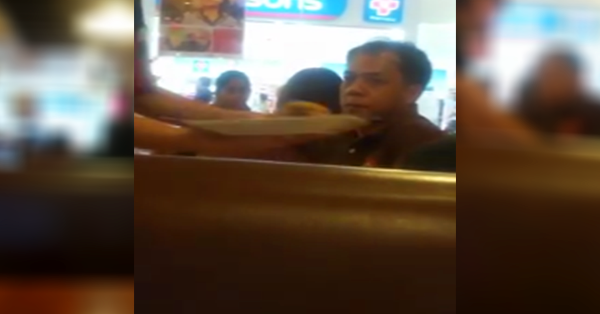 Watch How This Muslim Guy Embarrassed a Crew due to Serve Food with Pork! It is a big NO for Muslims to eat pork as it is part of the teachings of Islam. So the time that they are going to eat in a restaurant, they ensure first that the food they ordered and served to them are free from pork. However, there are instances that the crews are not aware of it or the other way around. In this video, which is now circling online, features a service crew who got scolded by a customer. The customer kept on shouting to the crew claiming that he was a Muslim and his food contained pork. The video was uploaded in Facebook by Tess Bee, who witnessed and filmed on how the 'arrogant' guy made the crew embarrassed in front of many people in the restaurant. According to the crew, the food they served with the order of his companion. Although the crew explained the scenario happened, the guy continued to shout and showed annoyance insisting that he was trying to eat food containing pork. Tess said that there is a proper way of talking about what happened regardless of who is accountable, instead showing arrogant acts against the crew. Watch the video below.